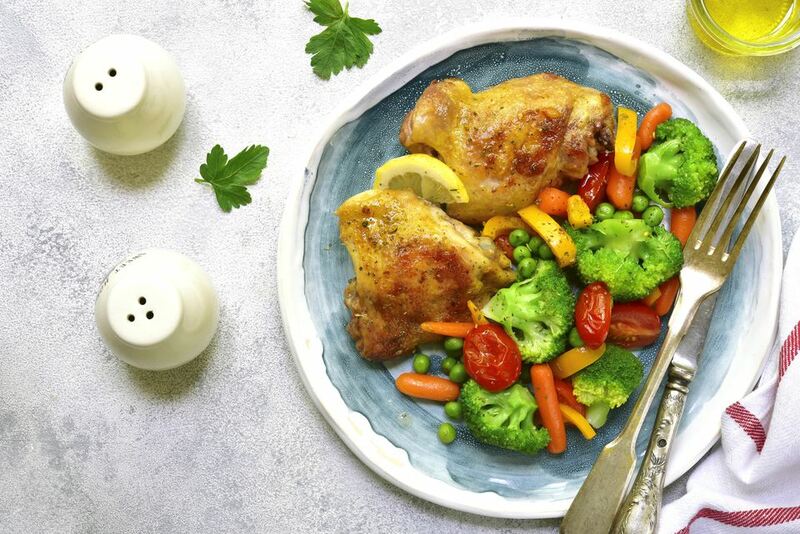 While lean, quick-cooking chicken breasts are convenient to have on hand for family meals, you just can't beat chicken thighs for their flavor, juiciness, and price. Chicken thighs maintain their excellent flavor and tenderness even when cooked for several hours in the slow cooker, while chicken breasts can become quite dry and tough. As with most slow cooker recipes, there's usually no need to sear the chicken before you add it to the crock. However, browning the chicken—especially if the skin hasn't been removed—can add flavor, color, and texture. If you have time, brown whole chicken thighs in a small amount of vegetable oil over medium-high heat. With only one bone running through the middle of chicken thighs, they're easy to debone. Just make cuts on either side of the bone and remove it while scraping off any meat that might be adhering. If you don't cook with chicken thighs often, these crock pot recipes will make you a believer. 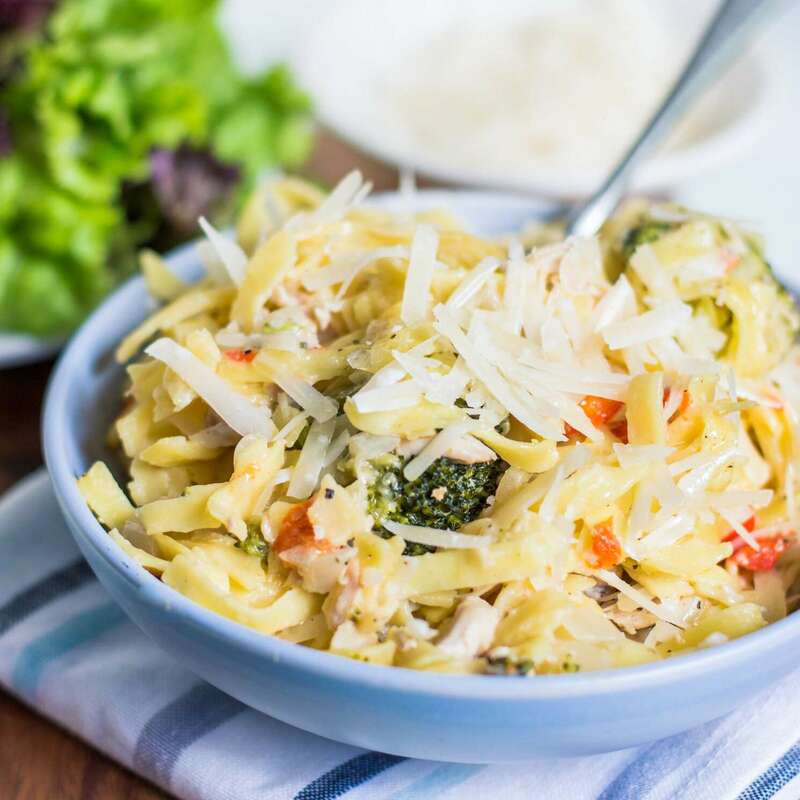 A jar of four cheese Alfredo sauce transforms cubed boneless chicken thighs into a delicious pasta-topper, and the slow cooker makes it super easy to fix and cook. Italian salad dressing flavors this chicken and potato crock pot meal. Only five ingredients, plus a dash of black pepper! Use chicken breasts or thighs in the recipe. Chicken thighs team up with stewing beef to make this delicious stew. This stew is similar to Kentucky's famous burgoo. Curry powder and ginger provide the flavor for tender, juicy chicken thighs and sweet potatoes. Peach preserves (or your favorite kind) sweeten the dish perfectly. These perfectly seasoned boneless chicken thighs are slow cooked to perfection with a variety of seasonings, black beans, and quinoa. Garnish servings with sour cream, green onions, avocado, and cheese. Make this chicken and dumplings with chicken thighs or chicken breasts. The dumpling mixture is dropped onto the chicken stew about 20 minutes before the dish is ready. As with many main dish recipes, if you don't like certain ingredients, just leave them out or replace them. This super easy recipe uses just two ingredients: chicken thighs and salsa. Choose a traditional tomato salsa or try something a little different. A fruity salsa would be fabulous. Purchased—or homemade—barbecue sauce and sweet and sour sauce team up in this fast and easy chicken dish. The simplicity of the dish makes it a great starting point. Add extra vegetables if you'd like. Farro is a great ingredient for the slow cooker because, unlike rice, it maintains its chewy texture over the long cooking time. This is a satisfying one-pot meal and an excellent way to use chicken thighs. Put the sauce back on the shelf! A dry rub flavors this spicy crock pot barbecued chicken. Boneless chicken breasts or thighs are slow cooked in a flavorful homemade tomato sauce. The chicken is fantastic served with piping hot spaghetti. A lightly sweetened lemon sauce flavors these boneless chicken thighs. Carrots and celery add texture and color. Serve the chicken with rice. Use chicken thighs or other parts to make this yummy chicken dish. The chicken is slow cooked with a tasty thickened honey-garlic sauce. Tender chicken thighs shred beautifully, making them the best choice for chicken barbecue. Top your chicken sandwiches off with your favorite slaw and extra sauce. Boneless chicken thighs make a fabulous burrito filling. A variety of vegetables and Tex-Mex seasonings flavor the chicken. When the dish is almost ready, the chicken is shredded and refried beans are added. Use this juicy, perfectly seasoned chicken to make tacos, burritos, or enchiladas. Make this dish with a variety of chicken parts or use all thighs or whole legs. Cola—or Dr. pepper—is blended with barbecue sauce to give the chicken barbecue flavor. The sweet-sour honey sauce mixture and fruit make this a tasty combination to serve with hot boiled rice. It might be low-fat, but it doesn't skimp on flavor. A variety of vegetables, tomatoes, and herbs flavor this easy crock pot stew. Spicy andouille sausage adds Louisiana flavor to this chicken and sausage combination. The dish is Creole-style with tomatoes, bell peppers, and onions. Peanut butter, lime juice, ginger, and a hot pepper team up to give these chicken thighs Thai flavor. Serve it with coconut rice for a real treat. This sweet garlic and brown sugar chicken includes carrots, bell peppers, and lots of garlic. Chicken thighs make this crock pot chicken chili extra flavorful. It's a classic chicken chili made with white beans, some corn, and seasonings. There are no tomatoes in this chili. Make this fabulous Tuscan-inspired chicken dish with chicken breasts or thighs. Serve the chicken with its sauce with hot cooked polenta, pasta, or rice. Add some cream to the sauce if you like and top it off with Parmesan cheese.